Passengers on Wednesday lynched a police man after he shot dead a passenger and wounded another following a heated argument over an alleged N50 bribe. The inspector who led one of his subordinates to mount a check point at Wuro-Dole village in Girei Local Area, Adamawa State was said to have rejected a N50 bribe offered by a commercial driver. This it was gathered led to heated argument which resulted in the incident. Motorists told Daily Trust correspondent that the police man, an inspector opened fire at a passenger who insisted that the N50 bribe would not be raised to N100. “The police inspector had misunderstanding with the passenger so he fired at them. He instantly killed him and injured another person. “When the passengers charged at him, he threw away his rifle and ran before they caught up with him and killed him with stones,” a commercial driver said. 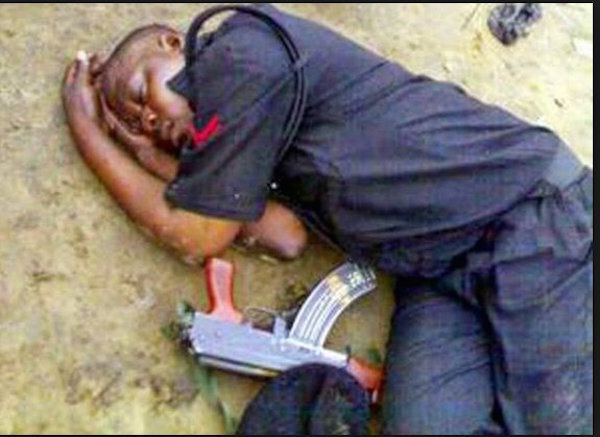 Daily Trust learnt that a team of police men had evacuated the corpse of the Inspector from the scene while nomalcy has returned to the village. The Police Spokesperson Othman Abubakar, a deputy supretendant, confirmed the lynching of the police man by the mob. “Two police men mounted a check point and stopped a vehicle. After the vehicle stopped, an argument ensued between the police man and the driver. “The inspector killed a passenger and injured another before he was killed by some of the passengers,” he said. Oh my Lord, all for greed!!! When are the Police going to be disciplined to act in accordance to their Office?? ?